The following classes are available for dealing with simple 2D geometry. The interface to each shape is similar; in particular, the connect and distance methods are defined identically for each. Process a pair of values passed in various ways. For 3D vectors, return the vector rotated around axis by the angle theta. Return the projection (the component) of the vector on other. Returns a Segment2 which is the minimum length line segment that can connect the two shapes. other may be a Point2, Line2, Ray2, Segment2 or Circle. A Line2 is a line on a 2D plane extending to infinity in both directions; a Ray2 has a finite end-point and extends to infinity in a single direction; a Segment2 joins two points. Internally, lines, rays and line segments store a Point2 p and a Vector2 v. You can also access (but not set) the two endpoints p1 and p2. These may or may not be meaningful for all types of lines. If other is a Line2, Ray2 or Segment2, returns a Point2 of intersection, or None if the lines are parallel. If other is a Circle, returns a Segment2 or Point2 giving the part of the line that intersects the circle, or None if there is no intersection. Returns a Segment2 which is the minimum length line segment that can connect the two shapes. For two parallel lines, this line segment may be in an arbitrary position. other may be a Point2, Line2, Ray2, Segment2 or Circle. Segment2 also has a length property which is read-only. a Segment2 giving the part of the line that intersects the circle, or None if there is no intersection. Two matrix classes are supplied, Matrix3, a 3x3 matrix for working with 2D affine transformations, and Matrix4, a 4x4 matrix for working with 3D affine transformations. Note that slices operate in column-major order, which makes them suitable for working directly with OpenGL’s glLoadMatrix and glGetFloatv functions. There are class constructors for the most common types of transform. The following constructors are defined for Matrix4 only. Multiplication is currently incorrect between matrices and vectors – the projection component is ignored. Use the Matrix4.transform method instead. Matrix4 also defines transpose (in-place), transposed (functional), determinant and inverse (functional) methods. A Matrix3 can be multiplied with a Vector2 or any of the 2D geometry objects (Point2, Line2, Circle, etc). A Matrix4 can be multiplied with a Vector3 or any of the 3D geometry objects (Point3, Line3, Sphere, etc). All constructors have an equivalent in-place method. For Matrix3, they are identity, translate, scale and rotate. 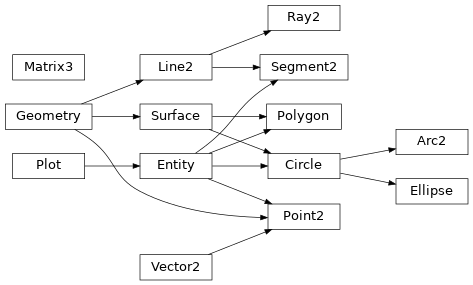 For Matrix4, they are identity, translate, scale, rotatex, rotatey, rotatez, rotate_axis and rotate_euler. Both Matrix3 and Matrix4 also have an in-place transpose method. The copy method is also implemented in both matrix classes and behaves in the obvious way. Return the net (uniform) scaling of this transform.